2. The exhibitor must produce all articles exhibited in this department. 3. If any article, in the opinion of the judge, is not entered in its proper class it will not be considered in the award of premiums. 4. Entries will be accepted between 1:00 p.m. and 4:00 p.m. Sunday before the fair and between 8:00 a.m. and 12:00 noon Monday of the fair. Entries must be in place by 12:00 noon Monday of the fair and must remain on exhibit throughout the entire fair. Items will be released between 12:00 noon and 4:00 p.m. Sunday after the fair. during the release times listed in rule 4. 6. The Fair Board and its Directors will not be responsible for the loss of exhibits or ribbons. 7. Ribbons for 1st, 2nd, and 3rd place will be awarded in each class. Premiums for each class are listed with the class. 8. 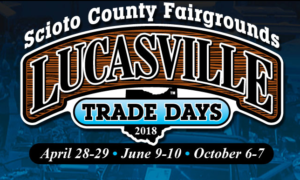 Exhibitors are limited to two entries per class and to Scioto County residents. 9. The “Any Other Article Not Listed” classes may be further divided if entries warrant. 10. No soiled, worn, or unfinished article will be considered by the judge in the award of premiums. Foreign work or purchased articles are prohibited. 11. Exhibitors are invited to witness the judging, which will follow Culinary judging. Approximate time – 12:30 p.m. The judge will give reasons for their decisions upon request. 12. Decisions of the judge or judges are final. 13. All premiums for an exhibitor that total less than $10.00 will be paid in cash at the time the exhibits are released. The exhibitor must sign a voucher stating that they have received payment. Premiums of $10.00 or more will be paid by check, but must be picked up at the time exhibits are released. No premiums will be mailed to anyone after the fair. Premiums not picked up at the time of dismissal will be considered a donation to the Society.